The material used in the SELL It, Don’t TELL It workshop is always tailored to the participants in attendance. However, the two-day workshop does follow a consistent agenda, which includes the following sections. Creating Your Personal Style: Since “perception is reality”, this exercise gets you thinking about how you appear to others, and helps you develop the way you want to appear to others. Creating a Listener-Focused Presentation: You will learn to present information in a way specifically focused on the goals and needs of your audience, and how to use language that reinforces this customer-focus. Communicating with Confidence: Next, you’ll eliminate words and phrases that hinder your projection of confidence, and learn to use powerful language without coming across as “pushy”. Effective Use of Visual Aids: EMS coaches will then recommend ways to create PowerPoint visuals that enhance a presentation rather than detract from it. They’ll also discuss how to effectively use visual media (computers, white boards, and handouts) to maximize impact and increase an audience’s ability to retain information. Q&As—Planning, Preparation, and Execution: The final discussion includes tips for handling question-and-answer sections with large or small groups and overcoming difficult or unexpected situations when they occur. 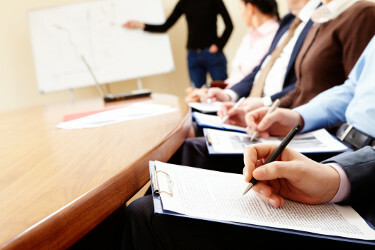 Since 1998, EMS Communications has been on a mission to rid the world of boring presentations. Attend a two-day public workshop and join the fight!